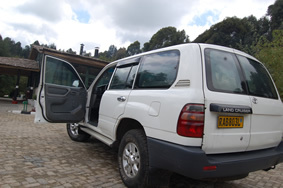 Gorilla trek Africa owns excellent safari vehicles to ease the movement of our clients to different tourism destinations. 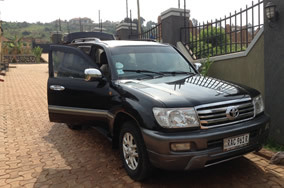 Our vehicles are serviced after every trip to keep them, to standard and to ensure the comfort of our clients. 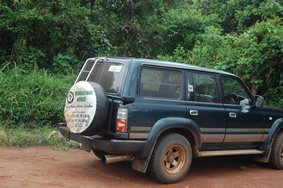 Our vehicles suit both short and long trips and have pop ups for wildlife viewing. More still, our vehicles vary in size from 2-seater to 44-seater depending on what our clients want and the number of visitors traveling together. The row of seats has a foot rest area. 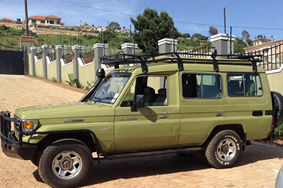 Game drive frames have a minimum of 3 roll bars standing upright5. The entrance for each client onto his/her seat has a secure lock. These carry four to six people in a forward facing direction. 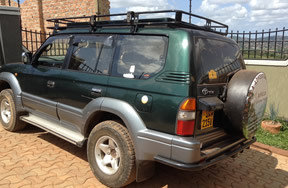 Land cruisers also travel safe on rough terrain and for long distances. 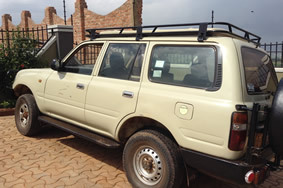 Also, most of our land cruiser vehicles are 4X4’s which make a safari very comfortable hence an interesting experience. Foe safety, our land cruiser vehicles have fire extinguishers, first aid kit, air bags and seat belts. They also have fridges to keep drinks cold and safe. These are mostly used by a large group of travelers probably 12 and above in numbers. They are fit for rough, slippery and muddy Africa roads with potholes and the like. The truck selected depending on the area to be visited and the terrain to be visited. The seats can be turned into forward facing, side facing or else back warding facing for comfort. The windows are transparent and large enough for great views. They can be opened horizontally and vertically for photography hence a memorable experience. This is used for large groups of travelers 6 and above. Interestingly, our super custom cars are very comfortable with curtains, seat belts, a fridge, air bags, first aid kit and fire extinguisher.